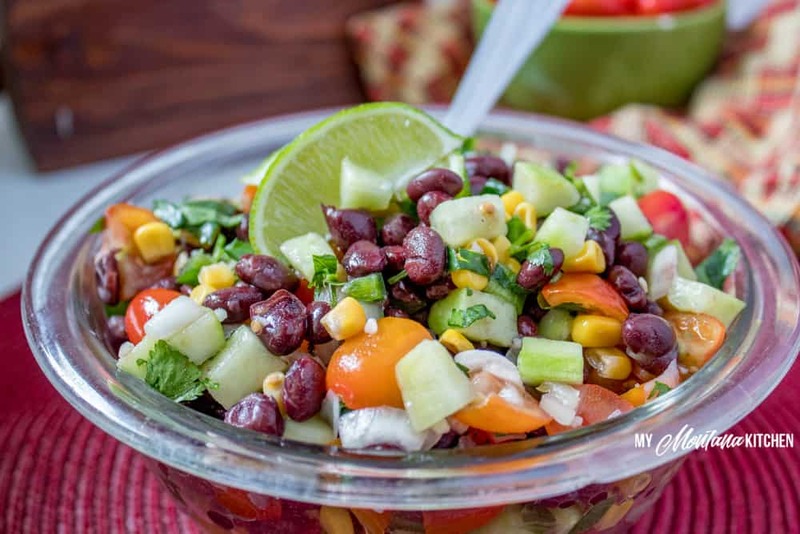 Filled with black beans, cucumbers, tomatoes, a bit of corn, and dressed with cilantro, garlic and lime, this easy Black Bean and Corn Salsa is a perfect summer treat. This recipe is low fat, sugar free, gluten free, dairy free and a Trim Healthy Mama E fuel. Ok, I admit it, I have been pretty boring in my life when it comes to varieties of salsa. My family loves salsa, so I usually buy it by the half gallon at Walmart. It is tasty, yes, but I’ve come to realize that store-bought salsa is NOTHING compared to fresh made. Duh, right? However, where we live now, and the season of life we are in, does not lend itself to having a large garden or doing much canning or preserving. I must confess that I miss having a garden. There is just something about going out and collecting food from your backyard – it doesn’t get fresher than that! I am putting together a recipe for Southwest Chicken Salad (complete with its own dressing) and I needed a black bean and corn salsa for my salad. One of the misnomers about Trim Healthy Mama is that all corn is off plan. While it is true that corn is very starchy and higher in natural sugars than most non-starchy vegetables, a little bit of corn is ok in moderation (see your Trim Healthy Mama Plan Book for more details). Trim Healthy Mama was founded upon solid, Biblical principles relating to food. No food group is out, and you can eat nearly any whole food when following the Trim Healthy Mama plan. With corn, you don’t want to go overboard, but there is only ¼ cup of corn kernels in this entire recipe (with 4 servings). So you only have 1 Tablespoon of corn in each serving. Very doable, and it adds a little pop of sweet to the salsa. Sometimes, I tend to eat the same E fuels over and over again. But it is good to be reminded that there is a large variety of E fuels, so we can keep those E meals interesting! This recipe does contain fresh cilantro. I know there are a lot of people who think cilantro tastes like soap, and that is ok. It is actually a genetic thing that makes it taste that way to some people. If you do not like the flavor of fresh cilantro, feel free to omit it. However, I think it adds a lot of flavor to this salsa! And my favorite part . . . is the fresh lime. I’m not sure why, but to me there is not much that smells better than a fresh lime. So clean, invigorating and refreshing! The fresh lime juice in this recipe just tops it off! You may be wondering how you can use this salsa? 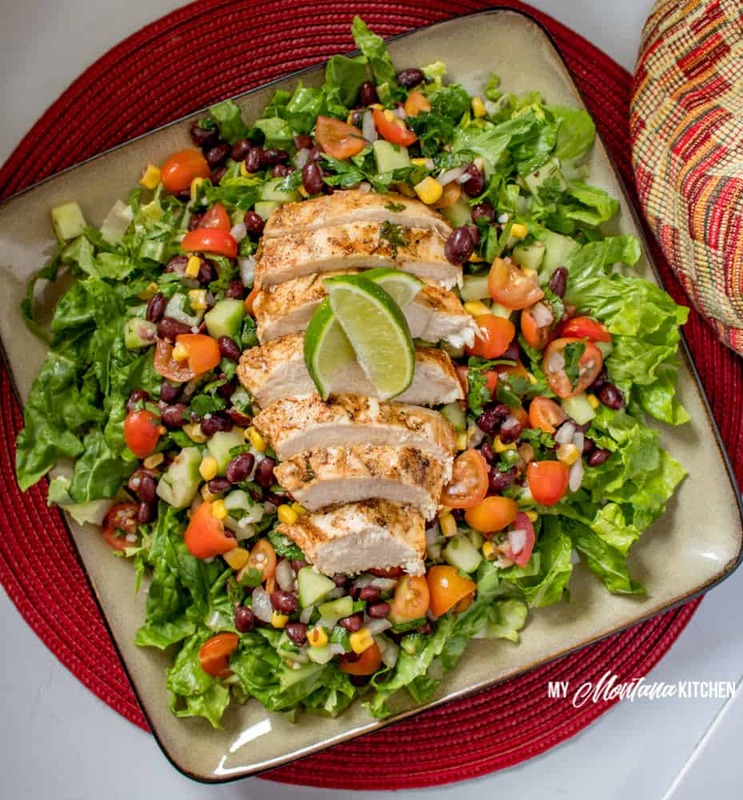 Well, if you can hang on for another week or so, I have a recipe coming for a Southwest Chicken Salad that uses this recipe. It would also be great to top grilled chicken. Or, since the carbs are not too high, you could even scoop it with some Baked Tostitos or Baked Blue Corn Chips. Cucumbers slices also make good dippers, as well as celery sticks. So what do you need for this Black Bean and Corn Salsa? Mix all ingredients together and chill for at least 2 hours for best results.